Are you ready to upgrade your lifestyle and start living fully in your Sweet Spot? During this retreat there will be time to reflect, to bond with an intimate group of like-minded women, to get clear on your life/business intentions and to make an action plan to turn your dream into reality. We will also spend time creating content and learning some powerful social media strategies to help you gain visibility online (I love Instagram!). Our days will include a balanced mix of scheduled Sweet Spot Style daily prompts and workshops, as well as plenty of time to process, rest, play and explore this culturally vibrant city. This VIP Sweet Spot Style experience is designed specifically for creative/entrepreneurial women whose business relates to home décor. San Miguel is an interior lovers dream come true. Although known for its art and writing scene, San Miguel is quickly becoming an epicenter for design. This retreat is perfect if you are an interior designer, stylist, interiors blogger/influencer or you have an online or offline décor-related shop. For this retreat only, we will have the opportunity to go inside a variety of San Miguel’s most amazing homes. We will also join interior designer, Christine Martin, in her boho lux show room for a custom Sweet Spot Style Stylist Workshop. Get your cameras ready! Beyond our home tours and stylist workshop, we will also visit some of the San Miguel’s best design stores for pure inspiration. Plus, for those of you who love a bargain, I will take you to the underground antique + flea markets. Who knows what we might find! Erica Reitman, otherwise known as the Design Ninja, will be teaching a morning workshop entitled Launch Your Design Biz. In this two-hour workshop you'll learn how to build your biz without formal training, get your first clients, and start earning money doing the work you love. Erica is an interior designer and writer for HGTV & the Travel Channel and has been featured on Domaine, Elle Decor, House Beautiful, Domino and Time Out NY to name a few. Follow her on IG at @ericareitman. Get ready for some major content creation for Instagram or you blog. This town is full of gorgeous design and we are gonna capture it LIVE. With an audience of nearly 40k, I've used IG as a tool to grow my businesses into a six-figure income. So take advantage of my knowledge and have fun while you're at it. You'll come home with endless content to share for months after your return home. Desha was a great facilitator. She helped me through a process that allowed me to get my thoughts and desires in order. Being with this group of women felt so supportive and empowering. This week has given me focus and a clear action plan that I can’t wait to implement. In fact, I’ve already got my next interior style workshop planned out! I would definitely recommend this retreat. I’ve already signed up to come back next year! 10:00-11:30: Enjoy a walking tour of San Miguel with our local guide, an expert on San Miguel’s rich history + culture. 11:30-1:30: Lunch at one of my favorite local cafes + visit to a couple of my fav shops. 1:30–2:30: Our first Sweet Spot Style Workshop. In this session, we will go over the pre-retreat workshop. You will report on what living in your Sweet Spot LifeSTYLE looks like + what your North Star is. 2:30-5:30: Now that we have a clear idea of what our Sweet Spot looks like, let’s move into workshop #2, which is on HOW to get what we want. Dinner on your own tonight + an evening at leisure for exploring the town on your own, or continue to work on workshop #2. 12:00-1:00: Lunch with Design Ninja, Erica Reitman. 1:00-3:30: This afternoon we will visit the working studio/show room of Christine Martin for our Stylist Workshop! 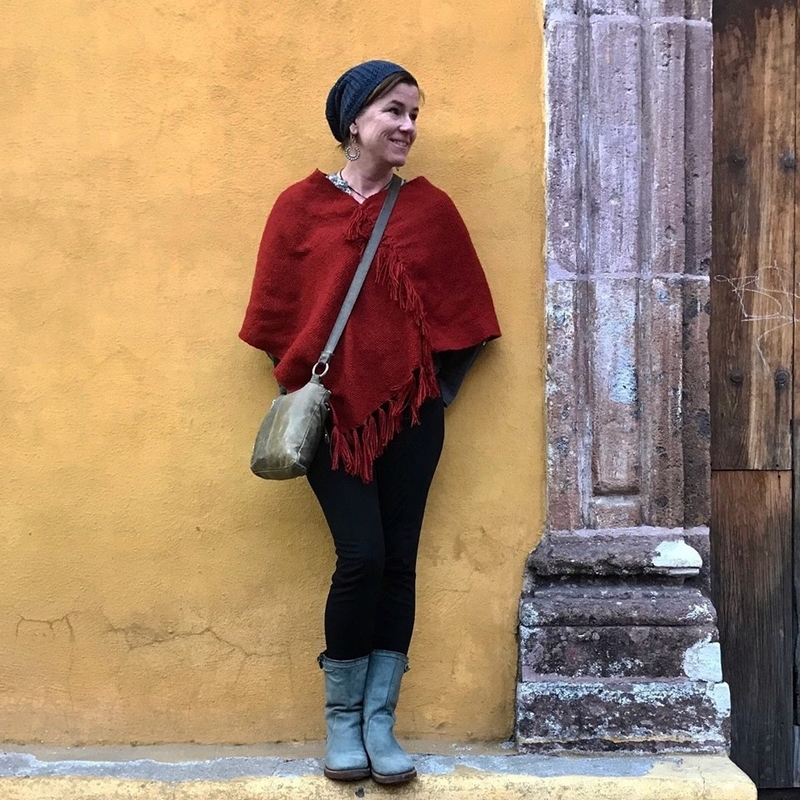 Christine is an interior designer who recently moved from LA to San Miguel where she’s offering in-person and online design consulting. During the workshop, we will learn how Christine has crafted her career in design, talk about the various ways to work in design these days, and get some tips for styling your space. Bring props and your camera. We will end the styling lesson with a content creation photo shoot. 4:00-6:00: Time on your own to rest, explore or continue working on your quarterly goals. 6:00: Tonight we’ll have a lovely dinner at the casa prepared by Luzma with special guest, Christine of @thegoodabode, who helped organize our style workshop today. 10:00-12:30: This morning we will visit San Miguel’s most famous thermal springs, La Gruta. Today, we will release any negative emotions or mindsets that have held us back in the past, so we can move forward with ease. This will take place in the deliciously warm La Gruta hot springs, one of the many natural thermal baths around San Miguel. You access the inner cave through a long, heated passageway to the inner sanctum where the warm waters will soothe and rejuvenate you. It’s the perfect spot for our releasing ritual, giving time and space to let go of anything that has been holding you back. 1:00- 2:00: Lunch on your own. 2:00- 4:00: Grab your camera, we are to our next home tour! 10:00- 12:00: Time for workshop #3, our ONE STEP CLOSER workshop, an open time for you to start working on one thing that will help you get closer to your sweet spot. Perhaps you’d like to write PR pitches, or create a social media or content calendar. This is sacred time to take inspired action towards your goals. 3:00-5:00: IG Workshop. How to Grow Your Brand on IG and more! Later… fancy a nightcap at the famous Rosewood Rooftop Bar? Today is a free day for you to continue working on your business, book your 1-1 with Desha, take a day trip or explore this marvelous town. Stroll through the Mercado Ignacio Ramirez with fresh-from-the-farm produce plus tortilla presses, juicers, & those cool plaid handbags of all sizes. As you continue walking downhill through the market you’ll reach the Mercado de Artesanias, a collection of stands displaying tin mirrors, hand-woven shawls, embroidered linens, hand-painted pottery & the latest folk-art trends. Look for the shop with oilcloth bags as you exit the market at Calle Loreto―inside you’ll find placemats, cosmetic cases, and more. Not far from the Mercado is La Fabrica Aurora, one of San Miguel’s most unique destinations, a beautiful art & design center housed in a former textile factory from the turn-of-the century. Here you’ll find working artist studios, contemporary art galleries, ageless antiques, unique furniture, textiles, home goods, handmade jewelry/clothing, & gourmet restaurants. There are several cafes and endless photo opps. You might also want to visit Botanical Gardens. Lunch is on your own. See the list below for recommendations. 7:00pm: Tonight you’ll get a chance to don a pretty dress and enjoy a farewell dinner at one of my favorite restaurants in town. This retreat helped me get really clear on what I needed to do and I have followed through with my stronger ‘why’ intact. I’ve put a lot of focus on mindset and action and feel more balanced in that way now than ever. I’m moving forward with more confidence, determination and momentum than I’ve had in a long time. 6 nights accommodation at a private home recently built by Mexican artisans. Everyone gets their own private bedroom with king size bed (sharing is optional). Investment for the interiors Retreat is $4000 (scroll to the bottom to register and learn how to SAVE!). I would enthusiastically recommend this retreat to a friend! The opportunity to connect, imagine, and work was such a privilege. Can’t wait for a reunion!